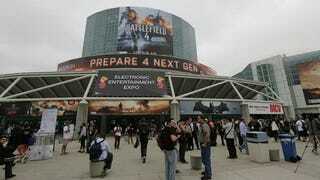 What Do You Want To See At E3 This Year? We're exactly two weeks away from E3 press conference day—Video Game Christmas—so why not spend some time fantasizing about what we'd like to see there? It would start with all the typical western FPS's, Sports games, things blowing up, etc... Then move into more niche realms, such as Indie Gaming and Playstation Eye gaming... But to close their show, they would address the RPG'ers in the crowd by showing A new Wild Arms, a new Legend of Dragoon, Dark Cloud 3, and Oreshika: Tainted Bloodlines for PS4 (as well as its current Vita build). The Kinect takes 3rd stage to real games. They show all the regulars we're bound to see. Halo 5, Television through the Xbox, Gears of War 4, Forza 5 or 6, Fable Again... Then the lights go dim, and a man walks onto stage. As the lights come back up to full, standing there is none other than Hironobu Sakaguchi and in his hands is a controller... And up on the big screen is a playable build of Blue Dragon 2. He demo's the game, then bows, goes to leave, stops, turns around and announces that Lost Odyssey 2 is in development as well. Mario, Luigi, Samus, Donkey Kong, Diddy Kong, Zelda, Link... We see them all doing what they've been doing for the past 15 years. Exciting, but the same. Then, they announce that they've joined an exclusive partnership agreement with SquareEnix to release a line of 'Nostalgia' based games, to build off of the current success of Bravely Default and recapture the magic of SNES. In that announcement they show a New Final Fantasy for WiiU that is classic FFIV - VI - IX in theme, style and gameplay called: Final Fantasy Classic or something like that... Then, they demo a brand new Co-op Secret of Mana game for the WiiU, all HD 2D imagery and awesomeness ensues... Finally, they close by showing Bravely Default 2. They apologize for being on vacation for so long, and then wow us with Proper versions of sequels we've been dreaming of. They start by showing off Phantasy Star V. Classic turn based RPG goodness in the vein of PSI to IV. They then show Shining in the Darkness II for the Nintendo 3DS. Followed by Shining Force IV for the PSIV and XBone... When the crowd quiets down from their joint nerdgasm, they close the show with Sword of Vermillion 2. They too apologize for being on vacation for so long. They show Metal Gear Solid: Non-MeloDramaticusDialogus Edition. Then, show Snatcher 2, followed by Suikoden HD collection containing HD remakes of S1 and S2 for XBone and PSIV. Then they show a new Vandal Hearts, followed by demoing a playable build of Suikoden VI. They say 'hey, we're still around... sorry for being vapid'... Then they announce that Grandia IV and Lunar 3 is on their way. BUT, Lunar 3 has been outsourced to Level 5. Along with the Nintendo announcement, they show Final Fantasy XV... And then Kingdom Hearts III, and then in closing, announce Chrono Trigger 3 and Dragon Quest XI for PS4 and Xbox One. They announce that they've decided to stop making JPOP girl band RPGs, and to start focusing more on darker story telling. They show Dragon Age 3, then Mass Effect 4... Then when they're done fist bumping each other and quoting 'button press equals awesome' for 30 minutes, they show Baldur's Gate 3. They sit down, load World of Warcraft and say 'Yeah, its old, but you know you still play it... because no one else can compete'. Then turn off their computers and leave. Amazing. I'm not sure I can compete with that one, but maybe you guys can outmatch Andrew. What's your wishlist? Post all dreams, fantasies, and predictions below.